The Friends of Mycenae Gardens have been working to aerate the ground beneath the London Plane trees. The first work session took place on Saturday 19 March and we have another arranged for Saturday 2 April. This work will improve drainage and oxygen content in the soil for the benefit of the trees. The bark mulch will reduce the risk of soil compaction in the future as well as increasing water retention. Volunteers have been pushing garden forks into the ground to the full depth of the tines and then wiggling the fork to and fro. The fork is then withdrawn. This process is being repeated every 6 inches or so to create vertical holes in the soil. This is strenuous work, especially on the back. 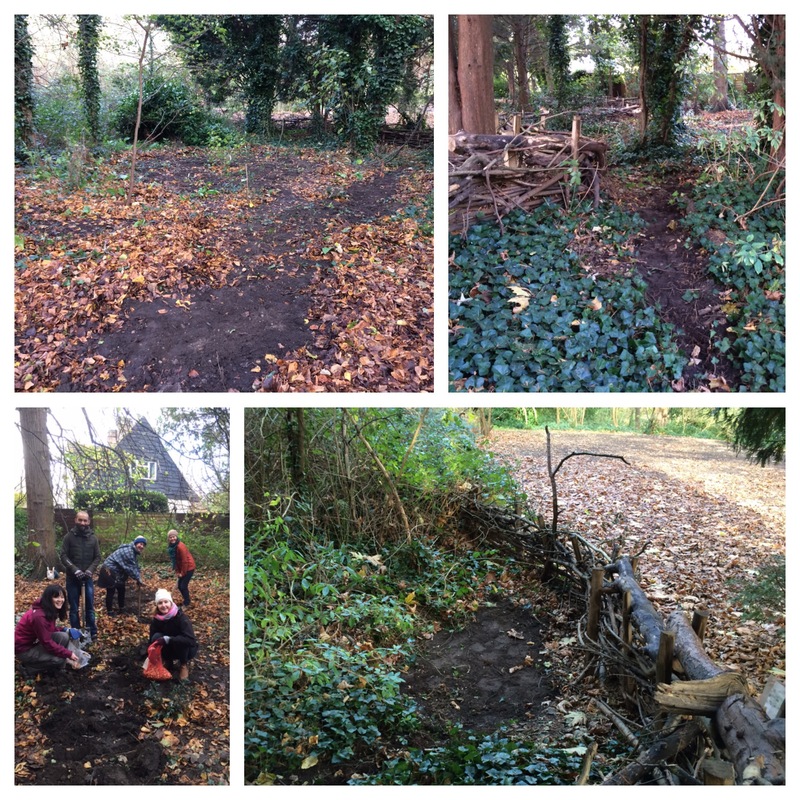 We are extremely grateful to members of the Friends group who have volunteered so far and to helpers from GoodGym who have been great company and who have made our progress much more rapid. The next work session will take place from 11am to 1pm on Saturday 2 April. If you can help please do contact us. The Friends of Mycenae Gardens will hold our Annual General Meeting on Tuesday 8 March. All welcome to attend – it is a great opportunity to meet others who share an interest in the Gardens. We are pleased to announce that Joe Beale, a local naturalist, has kindly agreed to be our guest speaker. UPDATE: Draft minutes from the AGM on 8th March 2016 are now available. Many thanks to all those who volunteered on Saturday to plant a large number of native bulbs kindly given to us by the Royal Borough of Greenwich. Within the area of dead hedging in Mycenae Gardens alongside plants that were established during Spring planting earlier in the year (thank you Wendy, Eileen, Jo, Sophie and Otis). We hope that you will all enjoy the results in the Spring!